These stands are very strong and are good to hold heavy music outside in strong winds. The only serious design fault they have is that you need to tighten the pivot nut to an unbelievable level or it will fall down when you least expect it (when using a heavy book or folder with over 200 pages). They extend very high indeed if needed for a split level stage or if you are a giant, but they are perfectly good at normal heights when seated. Heavy to carry 4 of them for a quartet and you need a large bag with wheels to carry them around. This music stand is for those who really wish to put something heavy on it. It surely will support the stuff, no problem. It's sturdyness also makes it inpractical to carry around. 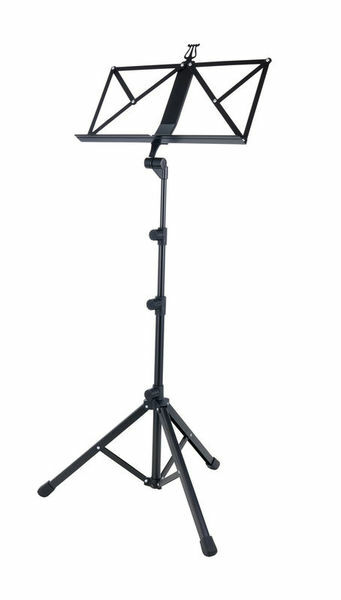 It won't work in touring since it's so much bigger than any other music stand (even when collapsed to the smallest possible form). You need a separate bag for it. ID: 162698 © 1996–2019 Thomann GmbH Thomann loves you, because you rock!